keep him safe and warm. When we celebrate Christmas at our house, we don't simply celebrate the birth of Jesus. There is more to the story and to the eternal hope that we have through the death and resurrection of our Lord. For this reason, I was pleased to review Tiny Baby Jesus. While reading Tiny Baby Jesus together this Christmas season, children and families can celebrate the gift of Jesus from head to tiny toes. As they turn the pages, they will discover the wonder of hands that develop into those of a carpenter and swaddled shoulders that grow to carry the weight of all mankind. Readers can share in the humble birth of tiny baby Jesus while remembering the life and teachings of the grown savior. Dandi Daley Mackall is the author of more than 400 books, including several titles for Zonderkidz such as The Legend of St. Nicholas, The Gift of the Christmas Cookie, the Ali Cat I CAN READ™ series, and the That’s Nat! early reader series. Dandi is the recipient of the 2009 Helen Keating Ott Award for Outstanding Contribution to Children's Literature from the Church and Synagogue Library Association (CSLA). Dandi and her husband, Joe, both write from rural Ohio, where they’re blessed with three children and a variety of horses, dogs, and cats. Visit http://www.dandibooks.com/ for more information. I am pleased to offer this beautifully illustrated book as a giveaway. We have FIVE copies to give to five winners. Be sure to leave a comment and contact information for each option you choose. 1) Leave a comment telling why you would like to win this book. 2) Tell about this giveaway through social networking such as Twitter or Facebook. Give it a thumbs up on Stumble Upon. You can leave a comment for each one you do. Be sure to leave a link or some way for me to track your entry. 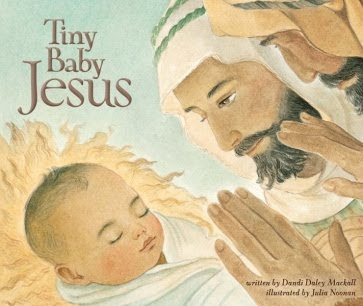 Tiny Baby Jesus is a hardcover book and retails for $16.99. This contest ends Sunday, November 15, 2009 and is available to those with a U.S. shipping address. The winners will be contacted via email and will have 72 hours to respond. will be great under the tree. I am babysitting some kids who come from a totally unchurched family. I would like to give this to them for Christmas. The kids and parents would learn about Jesus because the parents would have to read it to the kids. I would love to have this book to share with my two small children. I've been looking for a way to "introduce" them to Jesus in a way they can understand, and this seems like a really great way that they could grasp - especially since they're so young themselves! I have a book-aholic 2 year old, and with his love of books this would be a wonderful addition to the christmas season. I would be great to be able to share this with our toddler class at church. This is Vickie McMullen commenting that I posted this giveaway on my FB. While my kids know that Jesus is the reason we celebrate Christmas, having good books to help reinforce it is important. Looks like a beautiful book to share with my children. I would love to share this with my daughter. It would be great for her she is 4 and learning about Jesus. I would love to use this book as a Christmas present for my nephew and niece. Sort of an undercover way to share Jesus with them without being offensive! My son loves books and this is only his second Christmas so it would be great to read to him about it. I moved over 2,500 miles away from my only grandson, Antonio 4, in July because of a job situation (being laid off). His parents are not ones to talk to him about Jesus. Now I talk to him on Skype for a few hours a week where we can see each other at the same time. I think this book would be a great tool to read it to him while we talk on Skype and he can follow along with me. He loves books and this would be a meaningful time for us both. Thank you! I would love to win this to share with my family and my 1st graders at church. This would be great to share with my Sunday school class at church. We have 3 little ones and try to celebrate the full meaning of Christmas too. This looks like it would be a great addition! Our church is just starting a library, this would be a great addition! I love picking a Christmas oriented book or story to share with my boys for each of the days leading up to Christmas - this would be a fantastic addition! I'd love to share the Christmas story with my daughter this way! having 7 grandchildren and limited income right now due to serious illness, it isnt easy to find wholesome Christian gifts to pass to them. I would love to win this and be able to encourage them in their walk with the Lord! I'd love to have this book to share with my kids. I think this will be a great book to read with my son. I want to win it because it would be a great Christmas gift for my son! I would love this for my daughter, we love ready stories about Jesus..Everyone can use a little Jesus in their lives!!! I'd love to read this with my children. I would love to win this book so I could share it with all the children in our family. I would like to win this book because it's very easy for children (and adults too) to get so wrapped up in the excitement of Christmas and not focus fully on the real reason for it. I also think that this would be great for my children to really realize that Jesus was fully human and I think that would allow them to more easily identify with Him and His life. What a great book to share with young children. My niece loves books and I am very careful of what I let her read. I want her to understand the true meaning of the season and the greatest gift ever given to mankind. Thanks for the chance! I'd love to win this book to reinforce to my kids the real reason for the season. This would be a perfect book to read to my kids during the holidays! Thank you. I'd like the book so I can read it to my little one.